Helps Burn Fat Naturally! With L Carnitine & Green Tea. Recommended By Dr.Oz. Liquid Health, Inc., manufacturer of quality liquid nutritional supplements unveils new Raspberry Ketone formula developed to target different segments of health-conscious consumers. This new formula of Raspberry Ketones as found in clinical studies and as featured on Dr. Oz. 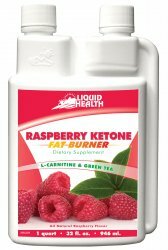 Liquid Health, Inc. maker of the Liquid Health branded nutritional supplement line of products, has launched a new raspberry ketone diet liquid to help burn fat in an easy to consume liquid solution. On February 6, 2012, Dr. Oz revealed in front of millions of people what he called the “miracle in a bottle to burn your fat”raspberry keytones. Dr. Oz suggested this was his number one solution, no matter what the body type or where the fat seems to collect. Red Raspberry Ketones are being touted as a “weight loss miracle” and have recently been featured on the Dr. Oz show. The Dr. Oz Show highlighted some of the research that has been done on the new ingredient. It was recommended to help support weight loss and to help target a hormone in the body that can aid in metabolism and the storage in fat cells. Clinical research conducted in 2004 showed that when mice were fed a diet that was high in fat. The mice’s diet was then supplemented with raspberry ketones. The results were astounding, the mice’s fat was melted, the resting metabolic rate of the mice was increased, and all of this with no other change in the diet. In contrast, a control group of mice that did not have raspberry ketones supplemented did not produce the same results. Additional research has shown that raspberry ketones help to regulate the hormone Adiponectin. Adiponectin is a hormone that helps the body to boost its metabolism and tell it when to stop storing fat. It can help to trick the body into thinking that it is thin. Raspberry Ketones also seem to help with the breakdown of fat (lipolysis) and the process of turning fat into energy (thermogenesis). The research also shows that there are no side effects from taking raspberry ketones. Raspberry Ketones have been on the FDA GRAS (generally recognized as safe) list since 1965. The Raspberry Ketones are the part of the raspberry that are responsible for the smell and taste of the raspberry. Raspberry Ketones as a weight loss tool haven’t taken off until featured on the Dr. Oz show. There are three main staples which anyone should follow no matter which diet program or health supplement you decide to follow or take. 1) Hydration - always keep in mind that nothing replaces water, not soda pop, not coffee, or fruit juices. 2) Food - no matter which weight loss supplement you choose, choosing to be active in eating a diet full of vegetables, fruits, seeds, nuts, beans, brown rice, and fresh meats will far outweigh any supplement available. Eating good things will always be better than eating bad things and then taking a supplement. 3) Rest and Sleep - knowing the fact that the body restores, replenishes, and repairs itself the best while in deep sleep and relaxation is always something we shouldn’t forget or take lightly. Liquid Health, Inc is a manufacturer of liquid vitamin supplements. Raspberry Ketones by Liquid Health is manufactured in a certified-cGMP (current Good Manufacturing Practices) facility, using only premium/qualified ingredients, analyzed, tested, and made in the U.S.A.
ANTI-OBESE ACTION OF RASPBERRY KETONE Chie Morimotoa, Yurie Satohb, 1, Mariko Harab, Shintaro Inoueb, c, 1, Takahiro Tsujitae, Hiromichi Okudad a Department of Medical Biochemistry, Ehime University School of Medicine, Shigenobu-cho, Onsen-gun, Ehime 791-0295, Japan b Basic Research Laboratory, Kanebo, Ltd., 5-3-28 Kotobuki-cho, Odawara 250-0002, Japan c Kampo and Healthcare Research Laboratories, Kanebo, Ltd., 3-1 Kanebo-machi, Takaoka 933-0856, Japan d Department of Environmental and Symbiotic Sciences, Prefectural University of Kumamoto, Tsukide, Kumamoto-city, Kumamoto 862-8502, Japan e Central Research Laboratory, Ehime University School of Medicine, Shigenobu-cho, Onsen-gun, Ehime 791-0295, Japan Received 24 August 2004. Accepted 21 December 2004. Available online 25 February 2005. Naoaki Haradaa, Kenji Okajimaa, Noriko Narimatsua, Hiroki Kuriharab, Naomi Nakagatac a Department of Translational Medical Science Research, Nagoya City University Graduate School of Medical Sciences, Kawasumi 1, Mizuho-cho, Mizuho-ku, Nagoya 467-8601, Japan. Department of Physiological Chemistry and Metabolism, University of Tokyo Graduate School of Medicine, Tokyo, Japan c Division of Reproductive Engineering, Center for Animal Resources and Development, Kumamoto University, Japan Received 10 September 2007. Revised 21 December 2007. Accepted 12 January 2008. Available online 5 March 2008. Order on line or call toll free at 1-877-291-8263.